On the stairs at St. Raphael’s Cathedral following my confirmation. 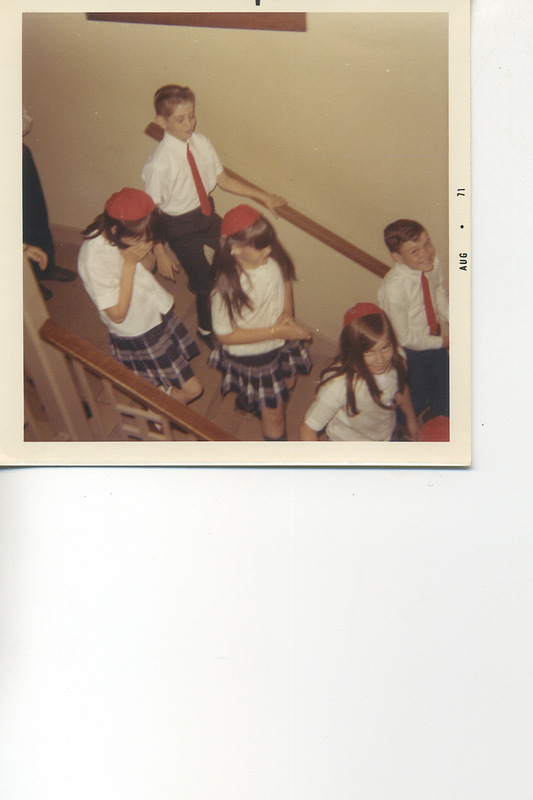 This was the day we were to become “adults” in the eyes of the Church…didn’t look or feel very much like an adult! However, I am the only one in the photo maintaining the prayerful attitude we were instructed by Sister Irma Mary to present all the way out of the church. Throughout my school years, I wore four different Catholic school uniforms, but this one was the best (way better than the red and gray plaid at St. Anthony’s)! Wool, all year. No pants, no shorts, no long-sleeved blouses – no matter what the weather or temp. What does it say about me that, of these children I went through five years of school with, I remember the names of both boys in this photo but neither girl? The boy behind me was my nemesis in classroom competition (especially Iowa Tests of Basic Skills; our scores were posted in order from highest to lowest, with names, at the front of the room). The grinning one in front was a regular in our recess games of “Batman and Robin” (I was Bat Girl. Though I longed to be Cat Woman, we all knew I couldn’t pull it off! ).